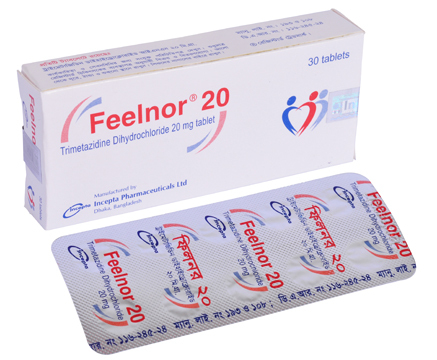 Feelnor 20 tablet: Each film-coated tablet contains Trimetazidine Dihydrochloride BP 20 mg.
Feelnor 35 MR tablet: Each modified release tablet contains Trimetazidine Dihydrochloride BP 35 mg.
* Ischaemic heart disease (angina pectoris, sequelae of infarction). One 20 mg tablet thrice daily after meals. No dosage adjustments are required in patients with impaired renal and hepatic function. One 35 mg MR tablet twice daily at mealtimes in the morning and evening. 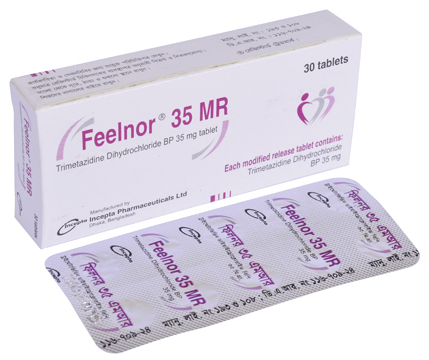 Feelnor (Trimetazidine) is safe and well tolerated. The most commonly encountered side effects are gastric discomfort, nausea, headache and vertigo. However, the side effects are mild and non-specific. Pregnancy: Studies in animals have not demonstrated a teratogenic effect. However, in the absence of clinical data and for safety reasons, prescription should be avoided during pregnancy. Nursing Mothers: There is no information on the secretion of Trimetazidine into breast milk. However, breast feeding should be discontinued if the use of Trimetazidine is considered essential.